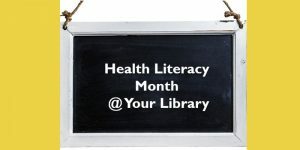 Description: October is Health Literacy Month. The American Library Association (ALA) and the National Network of Libraries of Medicine (NNLM) have created a Health Literacy Month toolkit for the Libraries Transform campaign. Join Amanda J. Wilson (NNLM) and Jeff Julian (ALA) as they discuss NNLM’s mission to support health literacy efforts in libraries and explain how to use the key messages, data, and marketing materials to promote health literacy at your library. This entry was posted in Education & Training, General, Information Resources, Library Management, Programming, Uncategorized, What's Up Doc / Govdocs. Bookmark the permalink. ← What’s Up @ the Commission?